Hyundai has revealed its facelifted 2010 Santa Fe in South Korea early of the market launch in July. In addition to minor changes in design 2010 model year will be completed with two new turbo diesel engines. On the exterior, changes seem to be compact to a lightly altered front end with a redesigned buffer and grille, reshaped outer mirrors with spinning signals and new alloy circle designs.There is talk about a newly designed rear bumper and tail lights along with an updated interior. The South Korean reports agencies also reported that the new Santa Fe repayment from the introduction of the Hyundai – Kia group’s newly developed ‘R’ diesel engine cast that consists of two 4-cylinder units with a displacement of 2.0-liters and 2.2-liters and outputs of 184HP / 392Nm and 200HP /436Nm respectively. Both engines are allied to a new six-speed automatic transmission. The new facelift Hyundai Verna Transform (old Accent) has been revealed in Korea. The new model has undergone several changes, both inside and out, the front plenteous has been tweaked, the front frame is distorted, new headlights and attribute mirror repeaters were installed. The rear bumper was also reconstructed and tail light were redesigned. The interior of the new Verana has been equipped with USB/ Auxiliary inputs for music lovers, a standard PowerBass subwoofer, Bluetooth connectivity and new downcast instrumentation lighting replacing the current green lights. Its centre console gets a facelift as well. At last week Hyundai releases first teaser sketches for its latest concept vehicle called the HED-6 (“ix-onic” concept) which was produced by Hyundai’s European project studios located in Russelsheim, Germany. New Hyundai concept car will make its debut at next month’s Geneva Motor Show. Designers of the new HED6 concept express it as an “city traveler” with cultural influences from major cities such as Berlin, Paris and London. However, its devoted scenery is a preview for the next-gen Tucson SUV. The new Tucson, which you can see spy shots of in our preceding legend, will go on auction later this year in the U.S. as a 2010 classic and will eventually be sold in Europe as the all-new ix35. After a few sketches and leaked photos the new 2010 Hyundai Equus flagship seadan has been revealed ahead of its Geneva debut. But Hyundai showed off the new Equus only to several dozen journalists, releasing a few photos to boot. Hyundai‘s luxury sedan hit the sell in the minute 1990s as a Mitsubishi-planned executive vehicle, that was also sold in Korea as a limo. It was not a worldwide vehicle, having been sold generally in Korea, parts of the Middle East, and China, with a few exported to Europe. The vehicle received a facelift in 2003. 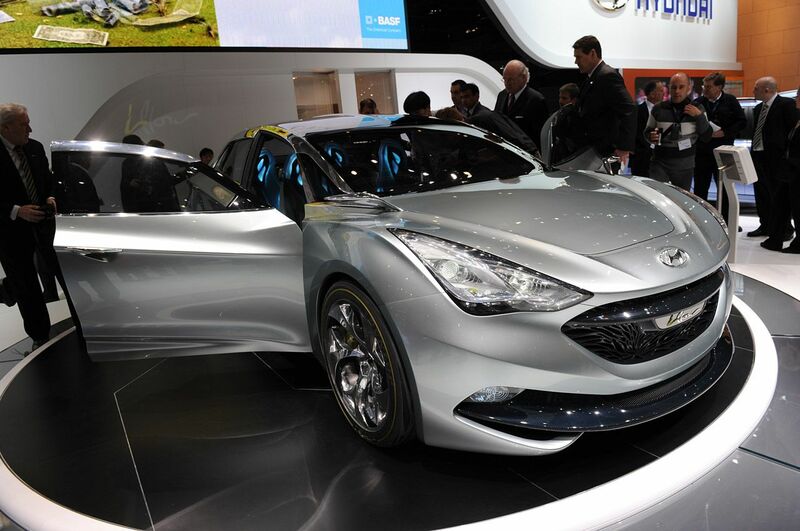 Hyundai opened a new Genesis Coupe “R-Spec” at the 2009 Chicago Auto Show. Korean automaker also announced pricing for its Genesis Coupe. The new R-Spec is based on the 210HP 2.0-liter Turbo form of the Genesis Coupe and it is planned to appeal to enthusiasts who want a low initial assess and the ability to change their car to their own specifications. When the Genesis Coupe begins to disembark at Hyundai dealerships later in the month, $22,000 will get you into an equitably well-equipped 210-horsepower, 2.0-liter, turbocharged, four-cylinder engine 2.0T fashion while $25,000 is the asking outlay for a stand, 306-horsepower, 3.8-liter, V6 engine fashion. Read more (details + photos + pricing)!! Hyundai has released details and a first teaser image of their HED-6 concept car which will entrance at the Geneva Motor Show in March. The HED-6 was styled at the troupe’s European Design headquarters in Rüsselsheim, Germany and it hints at Hyundai’s impending styling course for an eminent compact SUV. Power comes from Hyundai’s 1.6-liter GDi turbocharged engine which produces 175 HP. The HED-6‘s design enter back-swept front headlights, a hexagonal fencing, 21-creep mirror-polished alloy wheels, and a singular three-dimensional rear porthole that is made from high-performance forced instead of traditional beaker.